Police arrested a German-Russian citizen on Friday morning on suspicion of carrying out the attack on the Borussia Dortmund team bus last Tuesday, with prosecutors alleging that the bombing was motivated by financial greed. 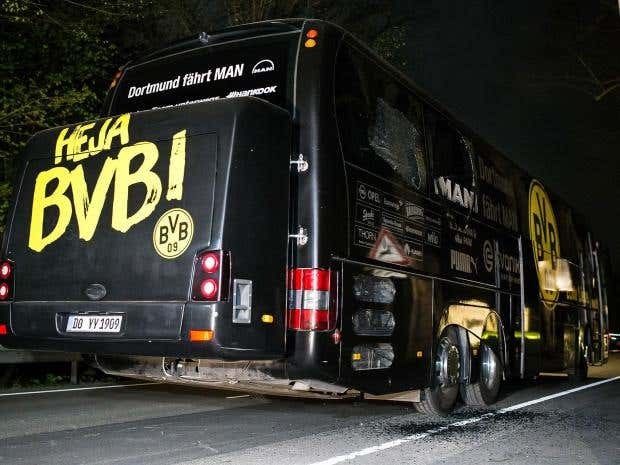 The Dortmund team bus was targeted with three bombs after it left a hotel to travel to the Westfalenstadion for the Champions League quarter-final first leg against Monaco. Defender Marc Bartra and a policeman were injured in the blasts, which saw the match postponed until the next day. Investigators found a letter close to the crime scene that appeared to claim responsibility in the name of Islamist extremists, but German police doubted the authenticity of the note. The flood of angry anti-Muslim rhetoric on social media was the first sign of how fiercely the suburban middle-class homeowners in this central China city opposed a planned mosque in their neighborhood. It quickly escalated into something more sinister. “I still remember when a girl walked into my salon in a burqa. Thinking she was a beggar, I told her to come back the next day. It was only after she removed her veil, I saw that she had lost one eye and the nose. Her chin and neck were constricted together,” said Masarrat while talking to DNA. 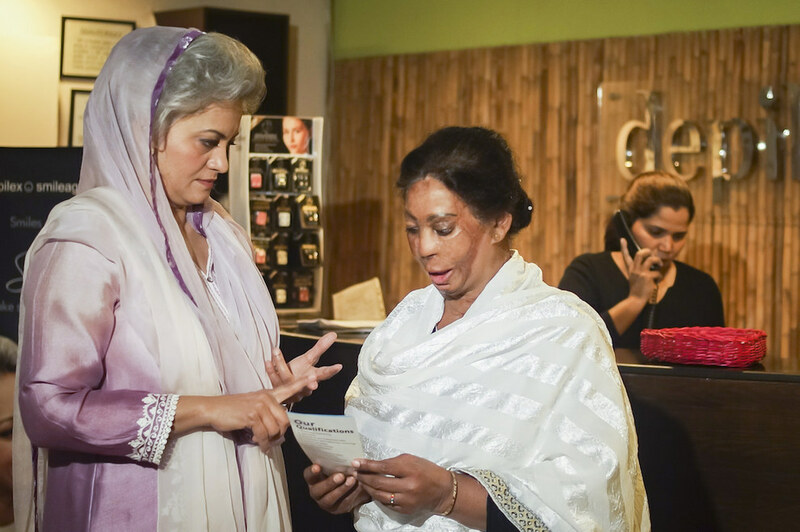 Masarrat Misbah is Pakistan’s well-known beautician-turned-philanthropist who needs no introduction. She is one of the first beauty experts to introduce the trend of professional beauty salons in the country. She started Depilex Institute, which became one of the biggest beauty training institutes in Pakistan with internationally qualified staff. With time she got inspired to incorporate the idea of ‘beauty with a cause’ with Depilex Smile Again Foundation after successfully running Depilex for years. She used this initiative to help acid attack victims and remove the stigma attached to it. Some more of Trevor! Cos I can't get enough! We do not want to confuse religion with culture at all. With religion it’s all about certain teachings and my views about culture is creating a whole community based on expectations. For this video I really wanted to touch upon black magic and Jinn. It’s not only in Pakistani or Islamic culture this subject is apparent in different forms for other cultures such as JuJu in African culture, Onymodo in Japanese culture, Quimbanda in Brazilian culture and many more. It is really hard growing up away from a culture when it is taught as part of growing up. By simply looking at the symptoms of all the serious mental health conditions can help educate a whole community in mental health in general. Education of mental health conditions is closing the doors on stigma and allowing people to openly seek for medical help without jumping into conclusion and assuming someone is possessed. Culture plays a big part in putting stigmas that are placed onto mental health. Growing up in a Pakistani household I was taught about the Jinn as part of Islamic theology, just like in school where you are taught ABC we were taught absolutely everything about Islam. Anyone who was thought of having a Jinn and being possessed were out casted in society and this was by culture, it was feared upon to such a point where ideologies ran off fear than teachings. With such negative thoughts clearly of the Jinn anyone labelled was afraid of being out casted and shunned, which in returns creates stigmas to possible serious mental health conditions. The fact that it is taught at such an early age is as important as it’s then really hard to adapt your thinking when you aren’t taught about mental health and distinguishing the symptoms to tell them apart. This is where the culture side of it needs to be taught for services as lack of understanding about the culture can isolate an individual, which in result can stop someone from accessing a service, the whole treatment and any sort of support. Being able to teach employees in a service is vital to someone’s mental health. If people are wondering why and how? Well, let me tell you about a situation I had not long ago where I had a conversation with a police officer who in return wondered why at the age of 29 I was still living at home and found it very strange, yet not realising in Islam it was knowledge and normal for any single female to live at home until she is married but just by him saying that made me feel like I must be weird and uncomfortable like I wasn’t normal since I wasn’t what he thought was ‘normal’. Where as if he was more understanding and changed the way he spoke to me about anything I said would have helped me become much more comfortable in opening up about anything!. My Sheikh being all awesome as always! We need to learn about our mothers and sisters, they are our first teachers. Much respect! Shariah is a word many are terrified of these days. Muslims will be asked do you adhere to Shariah? Are you committed to implementing it? Are you trying to replace our (of course much more civilized laws) with it? I am married according to Shariah, I eat meat slaughtered by its rules and have a bank account organized on its economical principles. I assure you that is nothing to panic about! Shariah is simply laws that have been enacted on Islamic principles, they are not uniform, they should be pragmatic and above all justice should be the goal. However miscarriages of justice occur in all legal systems, human beings are capable of making errors and justice is the casualty. This has occurred in Shariah too. In my homeland of India, triple talaq is upheld as part of Shariah, despite being banned in other Muslim countries. Pakistan unfortunately upholds blasphemy laws which many have argued contradict Shariah. Saudi Arabia refuses to let women drive citing all sorts of pseudo-religious/cultural reasons, none of which the vast majority of Muslims agree with. Those in power will often twist or misinterpret Islam and its principles for their own benefit/ to suit their agenda. Indeed we must be wary of this and call it out every time. This is an ongoing struggle. Being a history buff I enjoyed watching some clips/episodes of Turkish historical drama Magnificent Century. One of the most disturbing practices of the Ottomans was fraticide. (I certainly condemn the imperialism, incessant warring and entire concept of the Harem too) However it was quite sad to realize that Fatawa were given by the Ulema of Islam to Sultans to murder of their own brothers/half-brothers. Many Sheikhs argued it was better that a few princes were executed, rather than entire wars be fought between brothers for succession (for example the War of the Roses in Europe). One Sultan murdered nineteen brothers! Another killed his innocent and very capable son in a 'preemptive strike'! Why the Ulema couldn't stress cooperation between brothers, the need to serve the wider Ummah not the Dynasty, the sanctity of human life, the great sin that is fratricide is a great shame. However it has to be noted many Ulema also opposed this barbaric practice and gave Fatawa against it. For details please read this excellent article. As enacted in the clip above this particular Sheikh certainly misrepresented the Quran to give Sultan rather bogus reasoning to murder his own friend whom he had sworn to protect. (This may not be entirely historically accurate I am simply using as a possible example). So Shariah is certainly not safe from being twisted to serve the needs of those in power. Indeed it has been argued quite robustly that Daesh are doing exactly that. The interpretation of Shariah is dependent on the conscience of the people/scholars/jurists of Islam. Above all Shariah is a means to an end which is paramount. The end that is justice and compassion. That is what we must aspire to. What this teen wants you to know about the hijab after her dad's text went viral. Lamyaa, a 17-year-old from Pennsylvania, has gotten used to harassment from strangers online. Much of the time, their target is her Muslim faith. "Personally, being an Arab Muslim woman in America, these sort of hateful messages aren't uncommon," she explains. On April 14, 2017, Lamyaa tweeted a revolting message she'd received from a stranger. It read: "Stop defending Islam Bit*h shut up you couldn't take that scarf off or your dad would beat your as*." By "scarf," of course, the person was alluding to Lamyaa's hijab — a head covering worn by some Muslim women as an expression of their faith. Lamyaa decided to text her dad and ask him what he'd do if she did, in fact, decide not to wear her hijab — and his response made her tweet go viral. Since Lamyaa posted the offensive message along with her conversation with her father, her tweet has been liked and retweeted hundreds of thousands of times. "I have gotten many heartwarming messages of people showing me support, but also of people wanting to learn more about Islam or wanting to be a part of it," she explains. "I felt like I could help in a way, and it was very humbling." Lamyaa is using the attention to clear up harmful stereotypes about Islam, Muslim women — andMuslim men — and the hijab. "People believe that Islam is misogynistic, hateful, or violent, and I think that stems from their inability to differentiate culture and religion," she explains. "Islam is a religion and, like all religions, it is what you bring to it." For instance, some women are forced to wear a hijab, and that's a "horrible" form of oppression, the teen later pointed out on Twitter. But many Muslim women, like Lamyaa, wear one because they choose to — for a wide variety of empowering and personal reasons. "I wear my hijab because it is sacred to me," Lamyaa says. "It displays my connection to my faith and God. 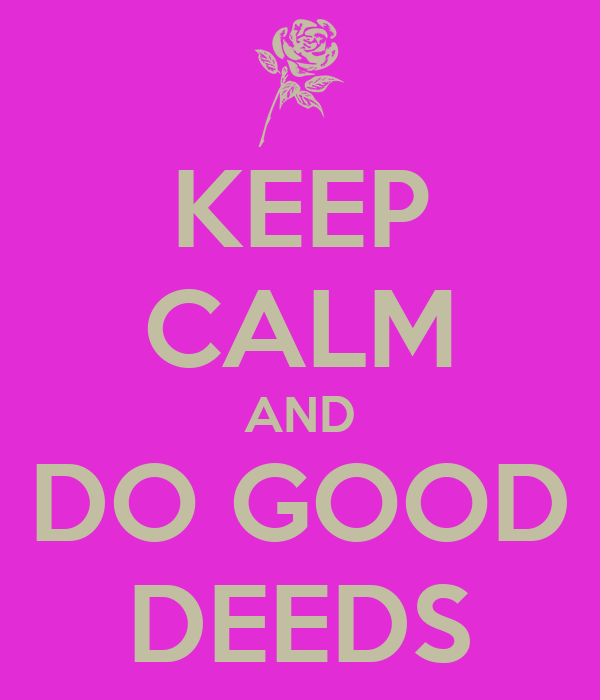 When I have the hijab on, I act kinder and I am more aware of what I say and do. This is because not only am I representing myself, but I am representing a faith much bigger than me." "If I had one thing to say to people who have misconceptions about Islam, it would be: Speak to a Muslim," Lamyaa says. "Have a conversation with a Muslim. Many of us are willing to answer any questions and clear up any misconceptions. Muslims are not some separate group. We are a part of America. We are people." The Prophet Muhammad (peace be upon him) told the story of two men, one of whom would commit sin and the other would strive to do his best in the world. When the man who exerted himself in worship continued to see the other in sin, he would say: "Refrain from (sinning)." The sinner replied: "Leave me alone with my Lord. Have you been sent as a watchman over me?" The teenager who led the Guardian-backed campaign to end female genital mutilation (FGM) has been awarded a doctorate for her campaigning work. Fahma Mohamed, 19, who will be a doctor of law, is one of the youngest people in the UK to receive the honorary degree, which will be presented by Bristol University on Friday. Mohamed said she was ecstatic at being awarded the doctorate. “This has been seven years of hard work, we had so many obstacles to overcome and struggles at the beginning because it was so taboo,” she said. “It was fighting against something people were in denial about, it was hard for people to understand our point of view and for people in the community to be able to come out and say I am against this, too. Mohamed was 14 when, along with the Bristol-based charity Integrate, she started the campaign to end the practice of FGM in Britain.